X. Modifications and survival of the idea of the crusade. The rise of the Seljukian Turks, however, compromised the safety of pilgrims and even threatened the independence of the Byzantine Empire and of all Christendom. In 1070 Jerusalem was taken, and in 1071 Diogenes, the Greek emperor, was defeated and made captive at Mantzikert. Asia Minor and all of Syria became the prey of the Turks. Antioch succumbed in 1084, and by 1092 not one of the great metropolitan sees of Asia remained in the possession of the Christians. Although separated from the communion of Rome since the schism of Michael Cærularius (1054), the emperors of Constantinople implored the assistance of the popes; in 1073 letters were exchanged on the subject between Michael VII and Gregory VII. The pope seriously contemplated leading a force of 50,000 men to the East in order to re-establish Christian unity, repulse the Turks, and rescue the Holy Sepulchre. But the idea of the crusade constituted only a part of this magnificent plan. (The letters of Gregory VII are in P.L., CXLVIII, 300, 325, 329, 386; cf. Riant's critical discussion in Archives de l'Orient Latin, I, 56.) The conflict over the Investitures in 1076 compelled the pope to abandon his projects; the Emperors Nicephorus Botaniates and Alexius Comnenus were unfavourable to a religious union with Rome; finally war broke out between the Byzantine Empire and the Normans of the Two Sicilies. It was Pope Urban II who took up the plans of Gregory VII and gave them more definite shape. A letter from Alexius Comnenus to Robert, Count of Flanders, recorded by the chroniclers, Guibert de Nogent ("Historiens Occidentaux des Croisades", ed. by the Académie des Inscriptions, IV, 131) and Hugues de Fleury (in "Mon. Germ. Hist. : Script. ", IX, 392), seems to imply that the crusade was instigated by the Byzantine emperor, but this has been proved false (Chalandon, Essai sur le règne d'Alexis Comnène, appendix), Alexius having merely sought to enroll five hundred Flemish knights in the imperial army (Anna Comnena, Alexiad., VII, iv). The honour of initiating the crusade has also been attributed to Peter the Hermit, a recluse of Picardy, who, after a pilgrimage to Jerusalem and a vision in the church of the Holy Sepulchre, went to Urban II and was commissioned by him to preach the crusade. However, though eyewitnesses of the crusade mention his preaching, they do not ascribe to him the all-important rôle assigned him later by various chroniclers, e.g. Albert of Aix and especially William of Tyre. (See Hagenmeyer, Peter der Eremite Leipzig, 1879.) The idea of the crusade is chiefly attributed to Pope Urban II (1095), and the motives that actuated him are clearly set forth by his contemporaries: "On beholding the enormous injury that all, clergy or people, brought upon the Christian Faith . . . at the news that the Rumanian provinces had been taken from the Christians by the Turks, moved with compassion and impelled by the love of God, he crossed the mountains and descended into Gaul" (Foucher de Chartres, I, in "Histoire des Crois. ", III, 321). Of course it is possible that in order to swell his forces, Alexius Comnenus solicited assistance in the West; however, it was not he but the pope who agitated the great movement which filled the Greeks with anxiety and terror. King Amalric profited by this respite to interpose in the affairs of Egypt, as the only remaining representatives of the Fatimite dynasty were children, and two rival viziers were disputing the supreme power amid conditions of absolute anarchy. One of these disputants, Shawer, being exiled from Egypt, took refuge with Nour-ed-Din, who sent his best general, Shírkúh, to reinstate him. After his conquest of Cairo, Shírkúh endeavoured to bring Shawer into disfavour with the caliph; Amalric, taking advantage of this, allied himself with Shawer. On two occasions, in 1164 and 1167, he forced Shírkúh to evacuate Egypt; a body of Frankish knights was stationed at one of the gates of Cairo, and Egypt paid a tribute of 100,000 dinárs to the Kingdom of Jerusalem. In 1168 Amalric made another attempt to conquer Egypt, but failed. After ordering the assassination of Shawer, Shírkúh had himself proclaimed Grand Vizier. At his death on 3 March, 1169, he was succeeded by his nephew, Salah-ed-Dîn (Saladin). During that year Amalric, aided by a Byzantine fleet, invaded Egypt once more, but was defeated at Damietta. Saladin retained full sway in Egypt and appointed no successor to the last Fatimite caliph, who died in 1171. Moreover, Nour-ed-Din died in 1174, and, while his sons and nephews disputed the inheritance, Saladin took possession of Damascus and conquered all Mesopotamia except Mosul. Thus, when Amalric died in 1173, leaving the royal power to Baldwin IV, "the Leprous", a child of thirteen, the Kingdom of Jerusalem was threatened on all sides. At the same time two factions, led respectively by Guy de Lusignan, brother-in-law of the king, and Raymond, Count of Tripoli, contended for the supremacy. Baldwin IV died in 1184, and was soon followed to the grave by his nephew Baldwin V. Despite lively opposition, Guy de Lusignan was crowned king, 20 July, 1186. Though the struggle against Saladin was already under way, it was unfortunately conducted without order or discipline. Notwithstanding the truce concluded with Saladin, Renaud de Châtillon, a powerful feudatory and lord of the trans-Jordanic region, which included the fief of Montréal, the great castle of Karak, and Aïlet, a port on the Red Sea, sought to divert the enemy's attention by attacking the holy cities of the Mohammedans. Oarless vessels were brought to Aïlet on the backs of camels in 1182, and a fleet of five galleys traversed the Red Sea for a whole year, ravaging the coasts as far as Aden; a body of knights even attempted to seize Medina. In the end this fleet was destroyed by Saladin's, and, to the great joy of the Mohammedans, the Frankish prisoners were put to death at Mecca. Attacked in his castle at Karak, Renaud twice repulsed Saladin's forces (1184-86). A truce was then signed, but Renaud broke it again and carried off a caravan in which was the sultan's own sister. In his exasperation Saladin invaded the Kingdom of Jerusalem and, although Guy de Lusignan gathered all his forces to repel the attack, on 4 July, 1187, Saladin's army annihilated that of the Christians on the shores of Lake Tiberias. The king, the grand master of the Temple, Renaud de Châtillon, and the most powerful men in the realm were made prisoners. After slaying Renaud with his own hand, Saladin marched on Jerusalem. The city capitulated 17 September, and Tyre, Antioch, and Tripoli were the only places in Syria that remained to the Christians. In the many attempts made to establish the Christian states the efforts of the crusaders had been directed solely toward the object for which the Holy War had been instituted; the crusade against Constantinople shows the first deviation from the original purpose. For those who strove to gain their ends by taking the direction of the crusades out of the pope's hands, this new movement was, of course, a triumph, but for Christendom it was a source of perplexity. Scarcely had Innocent III been elected pope, in January, 1198, when he inaugurated a policy in the East which he was to follow throughout his pontificate. He subordinated all else to the recapture of Jerusalem and the reconquest of the Holy Land. In his first Encyclicals he summoned all Christians to join the crusade and even negotiated with Alexius III, the Byzantine emperor, trying to persuade him to re-enter the Roman communion and use his troops for the liberation of Palestine. Peter of Capua, the papal legate, brought about a truce between Philip Augustus and Richard Coeur de Lion, January, 1199, and popular preachers, among others the parish priest Foulques of Neuilly, attracted large crowds. During a tournament at Ecry-sur-Aisne, 28 November, 1199, Count Thibaud de Champagne and a great many knights took the cross; in southern Germany, Martin, Abbot of Pairis, near Colmar, won many to the crusade. It would seem, however, that, from the outset, the pope lost control of this enterprise. Without even consulting Innocent III, the French knights, who had elected Thibaud de Champagne as their leader, decided to attack the Mohammedans in Egypt and in March, 1201, concluded with the Republic of Venice a contract for the transportation of troops on the Mediterranean. On the death of Thibaud the crusaders chose as his successor Boniface, Marquis of Montferrat, and cousin of Philip of Swabia, then in open conflict with the pope. Just at this time the son of Isaac Angelus, the dethroned Emperor of Constantinople, sought refuge in the West and asked Innocent III and his own brother-in-law, Philip of Swabia, to reinstate him on the imperial throne. The question has been raised whether it was pre-arranged between Philip and Boniface of Montferrat to turn the crusade towards Constantinople, and a passage in the "Gesta Innocentii" (83, in P.L., CCXIV, CXXXII) indicates that the idea was not new to Boniface of Montferrat when, in the spring of 1202, he made it known to the pope. Meanwhile the crusaders assembled at Venice could not pay the amount called for by their contract, so, by way of exchange, the Venetians suggested that they help recover the city of Zara in Dalmatia. The knights accepted the proposal, and, after a few days' siege, the city capitulated, November, 1202. But it was in vain that Innocent III urged the crusaders to set out for Palestine. Having obtained absolution for the capture of Zara, and despite the opposition of Simon of Montfort and a part of the army, on 24 May, 1203, the leaders ordered a march on Constantinople. They had concluded with Alexius, the Byzantine pretender, a treaty whereby he promised to have the Greeks return to the Roman communion, give the crusaders 200,000 marks, and participate in the Holy War. On 23 June the crusaders' fleet appeared before Constantinople; on 7 July they took possession of a suburb of Galata and forced their way into the Golden Horn; on 17 July they simultaneously attacked the sea walls and land walls of the Blachernæ. The troops of Alexius III made an unsuccessful sally, and the usurper fled, whereupon Isaac Angelus was released from prison and permitted to share the imperial dignity with his son, Alexius IV. But even had the latter been sincere he would have been powerless to keep the promises made to the crusaders. After some months of tedious waiting, those of their number cantoned at Galata lost patience with the Greeks, who not only refused to live up to their agreement, but likewise treated them with open hostility. On 5 February, 1204, Alexius IV and Isaac Angelus were deposed by a revolution, and Alexius Murzuphla, a usurper, undertook the defence of Constantinople against the Latin crusaders who were preparing to besiege Constantinople a second time. By a treaty concluded in March, 1204, between the Venetians and the crusading chiefs, it was pre-arranged to share the spoils of the Greek Empire. On 12 April, 1204, Constantinople was carried by storm, and the next day the ruthless plundering of its churches and palaces was begun. The masterpieces of antiquity, piled up in public places and in the Hippodrome, were utterly destroyed. Clerics and knights, in their eagerness to acquire famous and priceless relics, took part in the sack of the churches. The Venetians received half the booty; the portion of each crusader was determined according to his rank of baron, knight, or bailiff, and most of the churches of the West were enriched with ornaments stripped from those of Constantinople. On 9 May, 1204, an electoral college, formed of prominent crusaders and Venetians, assembled to elect an emperor. Dandolo, Doge of Venice, refused the honour, and Boniface of Montferrat was not considered. In the end, Baldwin, Count of Flanders, was elected and solemnly crowned in St. Sophia. Constantinople and the empire were divided among the emperor, the Venetians, and the chief crusaders; the Marquis of Montferrat received Thessalonica and Macedonia, with the title of king; Henry of Flanders became Lord of Adramyttion; Louis of Blois was made Duke of Nicæa, and fiefs were bestowed upon six hundred knights. Meanwhile, the Venetians reserved to themselves the ports of Thrace, the Peloponnesus, and the islands. Thomas Morosini, a Venetian priest, was elected patriarch. The loss of Saint-Jean d'Acre did not lead the princes of Europe to organize a new crusade. Men's minds were indeed, as usual, directed towards the East, but in the first years of the fourteenth century the idea of a crusade inspired principally the works of theorists who saw in it the best means of reforming Christendom. The treatise by Pierre Dubois, law-officer of the crown at Coutances, "De Recuperatione Terræ Sanctæ" (Langlois, ed., Paris, 1891), seems like the work of a dreamer, yet some of its views are truly modern. The establishment of peace between Christian princes by means of a tribunal of arbitration, the idea of making a French prince hereditary emperor, the secularization of the Patrimony of St. Peter, the consolidation of the Orders of the Hospitallers and Templars, the creation of a disciplined army the different corps of which were to have a special uniform, the creation of schools for the study of Oriental languages, and the intermarriage of Christian maidens with Saracens were the principal ideas it propounded (1307). On the other hand the writings of men of greater activity and wider experience suggested more practical methods for effecting the conquest of the East. Persuaded that Christian defeat in the Orient was largely due to the mercantile relations which the Italian cities Venice and Genoa continued to hold with the Mohammedans, these authors sought the establishment of a commercial blockade which, within a few years, would prove the ruin of Egypt and cause it to fall under Christian control. For this purpose it was recommended that a large fleet be fitted out at the expense of Christian princes and made to do police duty on the Mediterranean so as to prevent smuggling. These were the projects set forth in the memoirs of Fidentius of Padua, a Franciscan (about 1291, Bibliothèque Nationale, Latin manuscripts, 7247); in those of King Charles II of Naples (1293, Bib. Nat., Frankish manuscripts, 6049); Jacques de Molay (1307, Baluze, ed., Vitæ paparum Avenion., II, 176-185); Henry II, King of Cyprus (Mas-Latrie, ed., Histoire de Chypre, II, 118); Guillaume d'Adam, Archbishop of Sultanieh (1310, Kohler, ed., Collect. Hist. of the Crusades, Armenian Documents, II); and Marino Sanudo, the Venetian (Bongars, ed., Secreta fidelium Crucis, II). The consolidation of the military orders was also urged by Charles II. Many other memoirs, especially that of Hayton, King of Armenia (1307, ed. Armenian Documents, I), considered an alliance between the Christians and the Mongols of Persia indispensable to success. In fact, from the end of the thirteenth century many missionaries had penetrated into the Mongolian Empire; in Persia, as well as in China, their propaganda flourished. St. Francis of Assisi, and Raymond Lully had hoped to substitute for the warlike crusade a peaceable conversion of the Mohammedans to Christianity. Raymond Lully, born at Palma, on the Island of Majorca, in 1235, began (1275) his "Great Art", which, by means of a universal method for the study of Oriental languages, would equip missionaries to enter into controversies with the Mohammedan doctors. In the same year he prevailed upon the King of Majorca to found the College of the Blessed Trinity at Miramar, where the Friars Minor could learn the Oriental languages. He himself translated catechetical treatises into Arabic and, after spending his life travelling in Europe trying to win over to his ideas popes and kings, suffered martyrdom at Bougie, where he had begun his work of evangelization (1314). Among the Mohammedans this propaganda encountered insurmountable difficulties, whereas the Mongols, some of whom were still members of the Nestorian Church, received it willingly. During the pontificate of John XXII (1316-34) permanent Dominican and Franciscan missions were established in Persia, China, Tatary and Turkestan, and in 1318 the Archbishopric of Sultanieh was created in Persia. In China Giovanni de Monte Corvino, created Archbishop of Cambaluc (Peking), organized the religious hierarchy, founded monasteries, and converted to Christianity men of note, possibly the great khan himself. The account of the journey of Blessed Orderic de Pordenone (Cordier, ed.) across Asia, between 1304 and 1330, shows us that Christianity had gained a foothold in Persia, India, Central Asia, and Southern China. The capture of "New Rome" was the most appalling calamity sustained by Christendom since the taking of Saint-Jean d'Acre. However, the agitation which the news of this event caused in Europe was more apparent than genuine. Philip the Good, Duke of Burgundy, gave an allegorical entertainment at Lille in which Holy Church solicited the help of knights who pronounced the most extravagant vows before God and a pheasant (sur le faisan). Æneas Sylvius, Bishop of Siena, and St. John Capistran, the Franciscan, preached the crusade in Germany and Hungary; the Diets of Ratisbon and Frankfort promised assistance, and a league was formed between Venice, Florence, and the Duke of Milan, but nothing came of it. Pope Callistus III succeeded in collecting a fleet of sixteen galleys, which, under the command of the Patriarch of Aquileia, guarded the Archipelago. However, the defeat of the Turks before Belgrade in 1457, due to the bravery of János Hunyady, and the bloody conquest of the Peloponnesus in 1460 seemed finally to revive Christendom from its torpor. Æneas Sylvius, now pope under the name of Pius II, multiplied his exhortations, declaring that he himself would conduct the crusade, and towards the close of 1463 bands of crusaders began to assemble at Ancona. The Doge of Venice had yielded to the pope's entreaties, whereas the Duke of Burgundy was satisfied with sending 2000 men. But when, in June, 1464, the pope went to Ancona to assume command of the expedition, he fell sick and died, whereupon most of the crusaders, being unarmed, destitute of ammunition, and threatened with starvation, returned to their own countries. The Venetians were the only ones who invaded the Peloponnesus and sacked Athens, but they looked upon the crusade merely as a means of advancing their commercial interests. Under Sixtus IV they had the presumption to utilize the papal fleet for the seizure of merchandise stored at Smyrna and Adalia; they likewise purchased the claims of Catherine Cornaro to the Kingdom of Cyprus. Finally, in 1480, Mohammed II directed a triple attack against Europe. In Hungary Matthias Corvinus withstood the Turkish invasion, and the Knights of Rhodes, conducted by Pierre d'Aubusson, defended themselves victoriously, but the Turks succeeded in gaining possession of Otranto and threatened Italy with conquest. 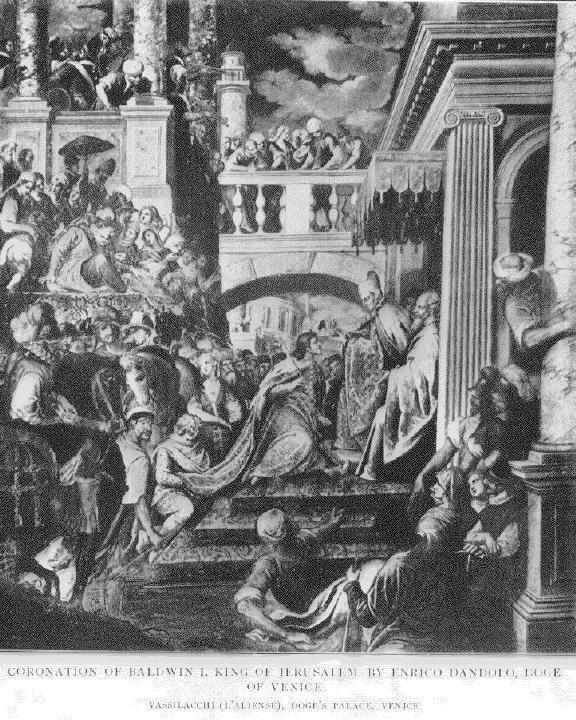 At an assembly held at Rome and presided over by Sixtus IV, ambassadors from the Christian princes again promised help; but the condition of Christendom would have been critical indeed had not the death of Mohammed II occasioned the evacuation of Otranto, while the power of the Turks was impaired for several years by civil wars among Mohammed's sons. At the time of Charles VIII's expedition into Italy (1492) there was again talk of a crusade; according to the plans of the King of France, the conquest of Naples was to be followed by that of Constantinople and the East. For this reason Pope Alexander VI delivered to him Prince Djem, son of Mohammed II and pretender to the throne, who had taken refuge with the Hospitallers. When Alexander VI joined Venice and Maximilian in a league against Charles VIII, the official object of the alliance was the crusade, but it had become impossible to take such projects as seriously meant. The leagues for the crusade were no longer anything but political combinations, and the preaching of the Holy War seemed to the people nothing but a means of raising money. Before his death, Emperor Maximilian took the cross at Metz with due solemnity, but these demonstrations could lead to no satisfactory results. The new conditions that now controlled Christendom rendered a crusade impossible. MLA citation. Bréhier, Louis. "Crusades." The Catholic Encyclopedia. Vol. 4. New York: Robert Appleton Company, 1908. <http://www.newadvent.org/cathen/04543c.htm>.